James Merryweather was born in Cambridge in 1948. Although thoroughly grounded and engrossed in biology from an early age, he did not begin to achieve academically until late in life, when eventually he stormed forward, and through research, gained first his masters (1993) and then a triumphant doctorate (1997). His research studies at the University of York involved Britain's favourite wildflower, bluebell, and fascinating soil fungi that inhabit its roots in the symbiotic partnership known as mycorrhiza. From this he learnt much about ecology and evolution, but not enough about the latter. He remedied that lamentable shortcoming when he arrived in Scotland, where there are people who argue with him (e.g. ), telling him that the science he knows a lot better than they do is untrue! One Reverend gentleman stopped him in his tracks and changed his whole future by asserting, face-to-face: "Of course, I don't believe in evolution", never flinching as he continued spouting utter balderdash. Evolution is a matter of belief as is the content of the Glasgow bus timetable. So James read it up in great detail, learnt it and discussed it with himself through a 'pseudo-blog' website called Blue-Skye Thinkers that very few people visited, that became a lot of published essays in The Freethinker (UK) and Secular World (USA), that eventually became his book Reality is enough. Then he demolished the website, which by then had become stagnant as well as redundant. 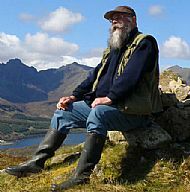 He retired early, when only 53, and in 2003 moved to the Scottish Highlands where he continued natural history study as well as teaching and preparing field guides, with the express desire to inform, not baffle users. He has two user-friendly fern guides published by the UK Field Studies Council and has produced many more (ferns, seashore, orchids, crabs etc.) available from the Highland Council and Skye & Lochalsh Environment Forum. The Highland Seashore Biodiversity Project saw him compiling his User-Friendly Seashore Guide, enabling anyone to identify seashore creatures using dichotomous keys, which usually frighten people into giving up. However, these keys are specially written for the use of real people and contain, as far as is possible, no scary technical terms. 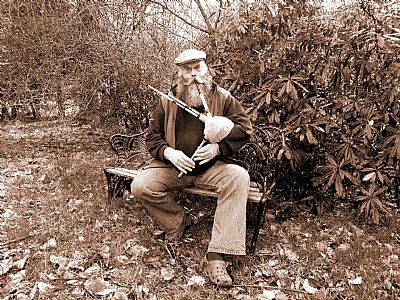 For almost thirty years he was a member of York's reconstructed renaissance town band, The York Waits, playing shawms, curtal, bagpipes etc. and may be heard on ten of their recordings. [The waits explained: At Home With Healey - The Town Waits. BBC Radio 4, 1 April &11 September 2001.] He has been principal bassoonist with the incomparable Skye & Lochalsh Orchestra and is owner of singular Scottish smallpipes fashioned by Ross Calderwood from the timber of the noxious invasive shrub Rhododendron x superponticum: 'The Rhoddiepipes o' Lochalsh', which he plays for musical enjoyment and to improve public awareness of the rhododendron problem. He has two grown-up daughters who, like him, enjoy good food and wine, and a grandson, young Toby. ABOVE: Prototype Rhoddiepipes in D with two drones. BELOW: Rhoddiepipes upgraded, with four drones and chanters in A, G, D, & C.